HUGEBOSOR4 is a modified form of BIGBOSOR4. Whereas BIGBOSOR4 will handle up to 295 shell segments, HUGEBOSOR4 will handle up to 2950 shell segments. 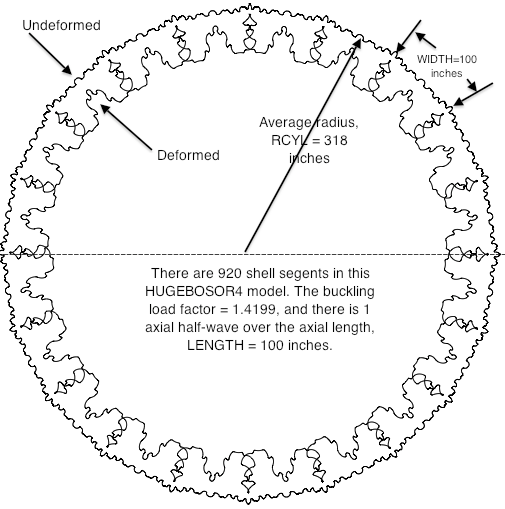 This increased capacity is especially helpful in computing load factors and mode shapes for the general buckling of truss-core sandwich cylindrical shells and complexly corrugated cylindrical shells such as those shown here. It is expected that HUGEBOSOR4 will be used mainly in connection with GENOPT or in any other context in which valid input files for HUGEBOSOR4 are generated by a computer program or by a subroutine rather than “by hand”. HUGEBOSOR4 is activated when the user gives the command, "HUGEBOSOR4LOG". The consequently activated command set for HUGEBOSOR4 is the same as that for BIGBOSOR4, but the FORTRAN coding in HUGEBOSOR4 has been modified greatly to expand the capability to analyze multi-segment shells of revolution and multi-segment prismatic shells. Minimum weight design of an axially compressed isotropic prismatic panel consisting of a series of cylindrical segments and verification by STAGS, David Bushnell and Michael S. Jacoby. AIAA Paper 2014-0844, 55th AIAA Structures, Structural Dynamics and Materials Meeting, part of SCITECH2014, National Harbor, Maryland, January 13-17, 2014. Minimum weight design of an axially compressed isotropic prismatic panel consisting of a series of cylindrical segments and verification by STAGS, David Bushnell and Michael S. Jacoby, 55th AIAA Structures, Structural Dynamics and Materials Meeting, (Part of SCITECH2014), National Harbor, Maryland, January 13-17, AIAA Paper 2014-0844, 2014. See Section 16 and Appendix 6 of the above paper (when it is published) for more details. Also see the GENOPT page of this web site. Fig. 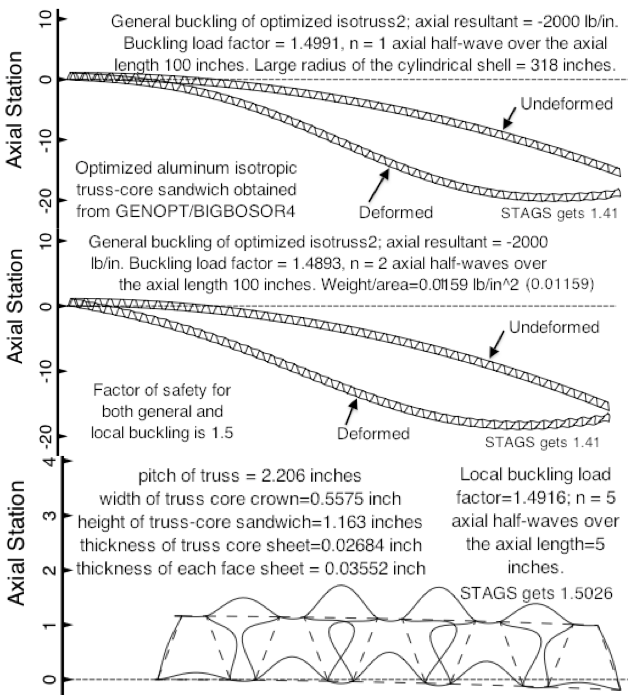 37: General and local buckling of an optimized aluminum cylindrical truss-core sandwich panel under uniform axial compression: 2000 lb/in normal to the screen. The panel was optimized by GENOPT/BIGBOSOR4/trusscomp . The weight of 90 degrees of the optimized cylindrical shell is 579 lb compared to 485.8 lb for the optimized cylindrical shell with the complex corrugated cross-section profile. The STAGS prediction of the general buckling load factor (1.41) was obtained by Dr. Frank Weiler. The results from a much larger HUGEBOSOR4 model are shown in Fig. A19. Fig. A19: A HUGEBOSOR4 model of 90 degrees of the optimized uniformly axially compressed truss-core sandwich aluminum cylindrical shell “equivalent” to the complexly corrugated cylindrical shell of the type shown below. This “huge” prismatic model includes all the little shell segments, some of which can be seen in the much smaller BIGBOSOR4 model displayed in the top two frames of Fig. 37. The 1434 individual little shell segments cannot be seen in this model because they are too small. This shell was re-optimized with HUGEBOSOR4. The new design: pitch of truss = 1.927 inches; width of truss-core crown = 0.3127 inch; height of truss-core sandwich = 1.142 inch; thickness of truss core sheet = 0.02720 inch; thickness of each face sheet = 0.03495 inch; new weight/area = 0.01158 lb/in2, very close to the old weight/area = 0.01159 lb/in2 given in Fig. 37. 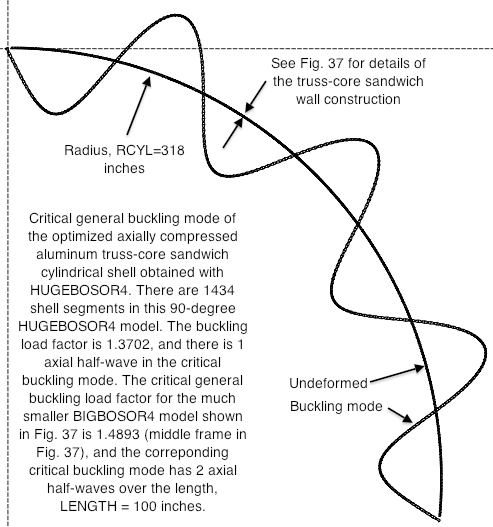 General and local buckling occur at load factors very close to 1.5 (the specified factor of safety). Fig. A20: The critical buckling mode and load factor from a HUGEBOSOR4 model of the optimized specific case called “fold913updwn” with “smoothing” present. There are 920 shell segments in this HUGE model. The complex corrugated cross-section profile was first optimized with the use of a much, much smaller BIGBOSOR4 model that includes only WIDTH/2 = 50 inches. The entire cylindrical shell consists of 20 repeating segments of WIDTH=100 inches.